One of the good things about having a job is having a Day Off. Today I have a day off so I can take the time to write. July 30th I will still be working and really like my job but if I had a choice, it would be my day off. I’m going to jump ahead to that day, at 10:22 p.m. when I am writing an e-mail to a friend. Hi (your name here)! It was my day off and had a beach day with the kids. C+K both had the day off, too, and brought M+M. J+W are staying with my sister’s for the week. Luckily we were able to get into Stony Point. This used to be Ipperwash Park before the Chippewas of Kettle and Stony Point took it back from the military. It was ‘borrowed’ in WW2 for training troops with the promise it would be returned when the war was over. It was not returned. 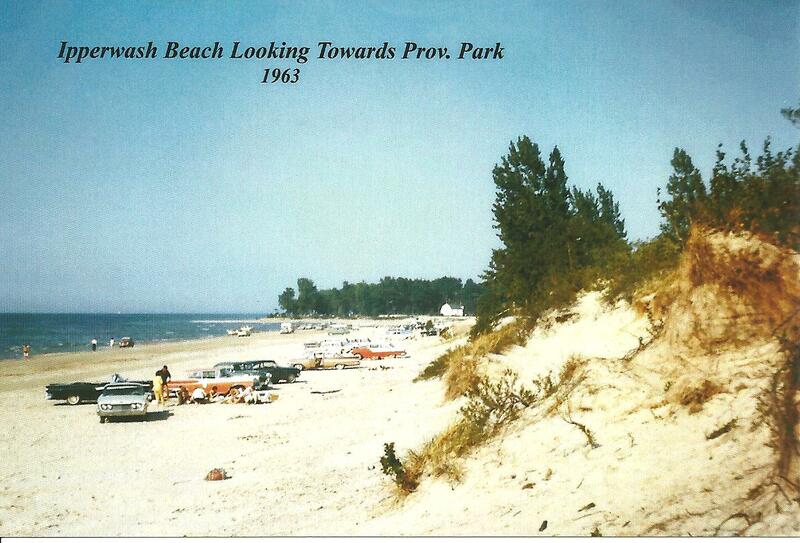 The beach there became Ipperwash Beach Provincial Park, run by the government. You might remember the big story about Dudley George being shot and the Ipperwash Inquiry that followed. (Google it) Yep, that was all right here. Anyway, it’s been closed to the public ever since then. They have a gate and booth set up just like at customs only a lot rougher. It’s kind of anarchy but, for now, they are letting Kettle Point band members use the beach. Since most of the family are band members we loaded up two vans and set out for the beach. I usually like the stretch of beach at the end of my road because they don’t let vehicles drive on it but it’s totally packed in this heat. The parking lots are full and if you find a spot on the beach it’s somebody’s volleyball court. And you know those kids are all peeing in the lake. Stony Point, on the other hand, has plenty of space and beautiful sand hills with pines and birch behind the beach. It’s not stony, it’s all sand and very shallow so it’s perfect for kids. And with kids, coolers, chairs, beach toys and blown up dinosaur, it’s nice to just pick a spot to park and keep the sliding doors open. We set up between the two vans putting the chairs in a semi-circle facing the beach. The kids are always so excited they just run into the water, screaming. Will tried to follow but he’s still scared of the water and started to cry when they left him behind. We all took turns carrying him out to watch the girls play but he’s just too damn heavy! You have to walk a long way out for it to even be up to your waist. When you see grown ups walk out and stand there….. you know what they’re doing. I like to go out on my boogie board and just lie on my belly. You’re in the water but lying in the sun, too. Easy to get fried! I can hang out with the kids playing and get a little exercise paddling around. And it gives me something to do when I have to watch them do hand stands 150 times. Awesome day! It was great to be all together and just laugh about stuff. I’m so happy to have them in my life. I came home, had a shower and tried to have a little nap but I couldn’t BECAUSE I had a date tonight! My first date in forever. He comes to get his bread sliced where I’m working. I thought he looked pretty good for our age but didn’t know if he was married or what. Last week I ran into him at the drug store and we got into a conversation; he’s a widower and asked me if I wanted to go out for dinner. I said I’m kind of a pain, being vegetarian and all, and he said he knew a great vegetarian restaurant in London. I’m still very nervous about letting someone I just met know where I live so I asked if he minded if we met at a local restaurant parking lot. He said, “no, I think that’s wise”! We went to SoZen …. really good except very overpriced for what we ate. He didn’t seem to mind, good sign, he even ordered tempeh, said he loved tempeh. Can’t believe it…… I almost don’t. I think I really like him. I’m writing because it’s getting late and I’m wide awake! I have to be in at 9:00 tomorrow because I’ve got a special order birthday cake to be picked up at noon. I’m just too excited to sleep! What a day! Footnote; I really hope I’m not having a bad day at work July 30th and then go back and read this. No, I have not met anyone. There is no restaurant named SoZen. I am fantasizing. NO!….. I’m VISUALISING!